Since the formation of Amazon Studios, I've been rather lukewarm about the efforts. The first batch of shows didn't really excite me and we didn't even consider gambling on any of the shows. With this second batch of pilots, we actually went as far watching the pilot for The After and felt terribly disappointed. But then came Transparent along and seriously, this is some of the best television that I've seen in a while - and it doesn't actually "air" on a television network! And I'm saying this not just because I'm gay and that I'm potentially more open to shows with strong LGBT themes at their core. I'm saying this because it's a damn good show. Like many good shows, it has a pretty solid center. And that center is not just the fact that it's about a transgender woman's struggle to fully own her identity. The center of this show is a family - a perfectly normal family that has its share of joys and complications. And the way that they deal with things individually or together is really where the stories come forth. 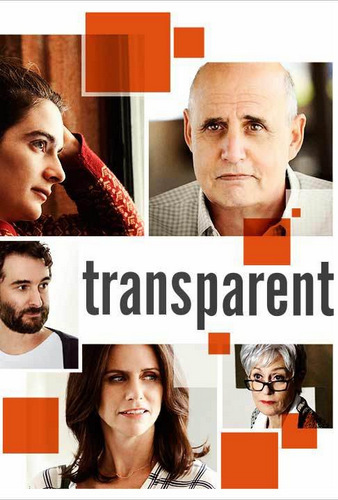 Synopsis: Transparent is an LGBT comedy-drama series produced by Amazon Studios. The series was created by Jill Soloway and runs for 10 episodes. And before you even ask, no, Soloway is not a transgender woman. The story centers around a divorced father born Mort (Jeffrey Tambor) but in truth is struggling with his gender identity as a transgender woman, Maura. She has kept this side of his life largely secret from her family, particularly her children. But now she is trying to find the strength to come out to her now-grown children and finally live life as herself. Her ex-wife, Shelly (Judith Light), is still alive and has since moved on in life with another man. Of course her children have had their own colorful lives as well. Her eldest daughter Sarah (Amy Landecker) is married to Len (Ron Huebel) but isn't entirely happy. And things get complicated when her highschool sweetheart of sorts comes back into her life. Josh (Jay Duplass) is the only son, and seems to have a proclivity for sleeping with woman after woman after woman. And finally there's Ali (Gaby Hoffmann), who hasn't really achieved much in life and is largely supported by her father - or rather, her mother. The show does an amazing job of illustrating many of the complexities of Maura's struggle. Beyond the initial challenge of coming out as a transgender woman, the real narrative lies in how she has to redefine her relationships with each of her children. And of course there's the greater challenge of finding the strength to finally embrace her true self in public, despite the potential reception from less tolerant people out there. And given the respective problems in each of the children's lives, they have far more issues to deal with beyond their father revealing that she's really their mother. And what was nice to note is that these issues weren't all somehow linked to Maura's gender identity (which would be an easy out for typically shows). Instead they are unique problems in themselves and require other solutions. I think what interested me the most is how each of the children seem to respond to Maura is different ways. Given Sarah's bisexuality (?) it seems easy to appreciate how open she is to Maura's coming out. But at the same time one can't help but wonder if she's overcompensating somehow, as if embracing Maura's coming out will help her come to terms with her own relationship decisions. Josh has immediate issues with Maura's revelation, but you also get to see him trying to learn more about transgender people on his own, albeit unusual way. And I don't know where to begin with Ali - she's a story in herself. At first I thought we could just dismiss her as some wild underachiever. But then as you pay attention to her actions and see how things develop over the course of the season, you realize that she may be dealing with a lot more tha initially expected. And it was totally foreshadowed! The cast is pretty brilliant together and the writing that defines the show gives everyone a spotlight moment or two as needed. The different sub-plots paint a pretty vivid portrait of where this family is now and the declaration that like any other family, they have more than their problems. Maura's coming out is just the beginning. And the way they portray this in a manner that is both light and yet respectfully serious is amazing. Both Please Like Me and Transparent are tagged as comedy-drama shows, but I think Transparent leans more towards the drama side. And this is neither a good thing nor a bad thing - it's merely defining the voice of the show and how it wants to tell its story. Transparent is a great series that everyone needs to see, especially given how transgender issues are dominating local headlines as of late. It's a show that will help a lot of people better understand what it means to be transgender and what it means to be a family. Thus the series gets a great 5 fabulous wigs out of a possible 5.